Home >> Health on the Go – There’s an App for That! Health on the Go – There’s an App for That! On Wednesday, April 6th, BCAHL’s webinar: “Health on the Go – There’s an App for That!” featured the innovative, emerging field of mobile health. 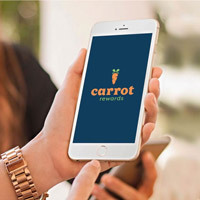 The webinar looked at the current research as well as opportunities for leveraging the ubiquitous smart-phone to promote health and wellness including BC’s recently launched Carrot Rewards App. Our first presenter, Dr. Emily Seto, with the University of Toronto, provided an overview of the emergence of MHealth as well as a case study to illustrate it’s efficacy in managing chronic conditions. Although the numbers are always moving, she shared estimates that there are over 165,000 health apps and that lifestyle and wellness apps make up the majority (over 50%) of health apps! Emily described how the best MHealth apps should come from a trusted source and when it comes to chronic disease management, they should both promote self-care AND be linked to clinical care. She showed how one example, Medly, led to better outcomes because it sends automated self-care feedback and alerts the user’s health clinic when necessary. In terms of drawbacks to MHealth, Emily described the condition of ‘pilotitis’ whereby an endless cycle of pilot projects demonstrate positive outcomes and healthcare savings but how those can’t be sustained unless there is healthcare funding to support clinicians’ involvement after the research funding is gone. She also cautioned: “be prepared to be obsolete” because the technology is changing so rapidly. Our second presenter, Christin Petelski with the Ministry of Health, told the story about how the Carrot Rewards App came to be the first app in Canada to reward loyalty points to British Columbians for learning how to live healthier. She described how this initiative was made possible through a multi-sectoral partnership that includes: the BC Ministry of Health and the Public Health Agency of Canada together with Social Change Rewards Inc. and the founding national NGOs (Heart and Stroke Foundation Canada, the Canadian Diabetes Association and YMCA Canada) and the BC Alliance for Healthy Living as well as leading loyalty point providers: Aeroplan, SCENE, Petro Points and More Rewards (Save on Foods). Christin introduced the app, explained how users can get point rewards and how the app’s performance will be evaluated. She explained how one of the main goals of Carrot Rewards is to design and deliver incentives in a way that builds people’s intrinsic motivation to engage in healthy behaviors – so they continue to engage in the behavior over the long-term.